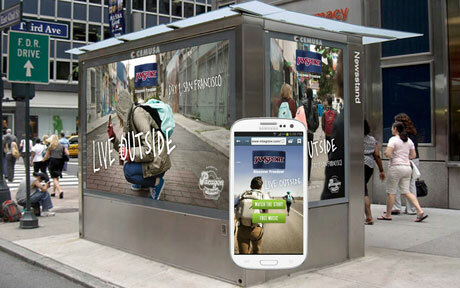 Outdoor wear manufacturer JanSport is running an advertising campaign across New York City combining Blue Bite’s mTag NFC platform, San Francisco-based Teak’s signage and out-of-home media buyer Kinetic’s consultancy. Deployed on Cemusa newsstands and transit shelters, the displays allow users to obtain custom video content from JanSport and listen to free music from local bands by tapping their NFC phones to a tag or scanning a QR code. “Mobile integration gives JanSport the opportunity to make a more meaningful connection with our audience by layering in content — music in this case — that adds value, enhances our brand message and encourages deeper consumer participation with the brand,” says JanSport brand director Courtney Blacker.